We’d love your help. Let us know what’s wrong with this preview of Moscow Bound by Adrian Churchward. To ask other readers questions about Moscow Bound, please sign up. A riveting read and a chilling political thriller in the vein of John Le Carré, Frederick Forsyth with the geo-political conspiracy laced edge of a Robert Ludlum or Tom Clancy. All in all, the book is informative, the dialogue sparkles and you will not be disappointed by the various plot twists and thrills. All characters are well rounded and three dimensional, and the Anglo-Russian political drama is an interesting concept and pertinent to modern day current affairs. I found the main character A riveting read and a chilling political thriller in the vein of John Le Carré, Frederick Forsyth with the geo-political conspiracy laced edge of a Robert Ludlum or Tom Clancy. All in all, the book is informative, the dialogue sparkles and you will not be disappointed by the various plot twists and thrills. All characters are well rounded and three dimensional, and the Anglo-Russian political drama is an interesting concept and pertinent to modern day current affairs. I found the main character Scott Mitchell to be humorously laconic, well developed and almost a flawed anti-hero, although he shows his metal as the plot develops. This book was gripping from the first page, the type of book you just can't put down! I hope the next one is here soon. Book 1, in “The Puppet Meisters” trilogy. This is an engaging story that surely will please anyone who is interested in reading thrillers set in contemporary Russia and enjoys navigating the complexities of its law, its bureaucracy and are concerned about the ever-growing abuses of state power. Scott Mitchell, the fictionalized idealistic human rights lawyer, is one of the messengers in this suspenseful and very captivating novel that revisits Cold War themes. The story opens with an electrifying Book 1, in “The Puppet Meisters” trilogy. The story opens with an electrifying start and keeps the tempo throughout and never let go, so be ready to stay captivated for hours. Although keeping with the Russian names may be somewhat of a challenge but is a lot of fun once into it, I for one, gobbled it down in now time. The author handles the various threads competently and has provided us with a story that has depth and populated with rich and archetypal characters we came to expect in modern day political tales. To add colour we have the gorgeous Ekaterina, young Russian mother separated from her oligarch husband and Pravda, a Lieutenant-General of the GRU (military intelligence). The main plot and sub-plots have all the exciting elements: The book opens with Scott Mitchell, a human right activist, a hero and defender of ethnic minority manages right from the start to get in trouble with the Russian army. One thing leads to another and Ekaterina shows up needing Scott’s help finding her father, a man who was spirited away by the KGB years ago. Now more mystery is added when POV characters are found murdered in particular manner, Pravda, an honest and patriotic soldier gets mixed in and slowly we are into an explosive military secret that is at risk to be revealed. I thoroughly enjoyed this book and looking forward to its sequel. Scott Mitchell has just won a case against the Russian military. Needless to say he has made a name for himself but he has not made many friends. Ekaterina Romanova is on the hunt for her missing father and she turns to Scott to find him. But every where they turn they run into trouble. General Pravada was assigned the task of watching over some men years prior and has learned the Scott and Ekaterina are interested in one of those men. So, he tries his best to detour them from finding him. But he Scott Mitchell has just won a case against the Russian military. Needless to say he has made a name for himself but he has not made many friends. Ekaterina Romanova is on the hunt for her missing father and she turns to Scott to find him. But every where they turn they run into trouble. General Pravada was assigned the task of watching over some men years prior and has learned the Scott and Ekaterina are interested in one of those men. So, he tries his best to detour them from finding him. But he starts questioning his job when secrets start coming out. This is an interesting book. I couldn’t help but get wrapped up in the story, especially with that prologue. This book is so detail oriented I felt right there along with Scott and Ekaterina trying to find her dad. I like the dynamics on the search. Ekaterina has more information than what she is giving Scott but it’s like pulling teeth to get it. And Scott, after his legal battle with the military you would think that he would know now to trust any of them. I admit that I don’t really read that many stories along the line of this book but I’m really glad that I did. I couldn’t wait to see what was going to happen next. This is a great, fast paced book with lots of twists and turns. I can’t wait to find out what happens in the next book. Originally posted in This is Lit - Book Blog. I didn’t give this book’s sequel a glowing rating because I had problems with the plot. Moscow Bound, however, is so much better and was definitely intriguing to read. Ekaterina, one-dimensional in the next book, sounds a little more alive in this one. This book has excellent writing. One problem some readers may have is pronouncing and remembering the Russian names in this Originally posted in This is Lit - Book Blog. This book has excellent writing. One problem some readers may have is pronouncing and remembering the Russian names in this book. I’m good with remembering names and I didn’t find the Russian ones that difficult, but I’m not so sure about other readers. This is an entirely plot-driven book–the plot is airtight and has just enough political intrigue, action, and drama to make this an engrossing read. This could easily have been a 5-star read if it weren’t for the characters. A little bit more life and character development would definitely have pushed this book to a 4.5 at least. Scott bravely returns to Moscow where he works, but he's upset a powerful enemy and his return to Russia is not an easy one. The publicity he has gained sends a new client to him Moscow bound is a mystery set in and around Moscow in 2013. It begins with a murder of a lone man. The rest of the tale is spread over a time period of just over a week, filled with plenty of action. We meet Scott Mitchell, a human rights lawyer who has just won a case in the European courts against the Russian military. Scott bravely returns to Moscow where he works, but he's upset a powerful enemy and his return to Russia is not an easy one. The publicity he has gained sends a new client to him. Ekaterina Romanova is searching for her father who has been held captive without trial for many years. She only has one thread of a trail to start their search but when they get caught on camera at the scene of a crime more than one set of people want to know more about them. I am very grateful to Netgalley for providing a kindle copy of this book to read and honestly review, particularly in view of the fact that this a quite brilliant read. Ekaterina Romanova the estranged wife of Russia's wealthiest oligarch, employs Scott Mitchell English civil rights lawyer based in Moscow, and considered public enemy number one following his success defending Chechen's in European court of human rights. She wants him to find the father she has never met and believes is languishin I am very grateful to Netgalley for providing a kindle copy of this book to read and honestly review, particularly in view of the fact that this a quite brilliant read. Ekaterina Romanova the estranged wife of Russia's wealthiest oligarch, employs Scott Mitchell English civil rights lawyer based in Moscow, and considered public enemy number one following his success defending Chechen's in European court of human rights. She wants him to find the father she has never met and believes is languishing in the Gulag system for over thirty years without trial. General Pravda of military intelligence will hinder their search at every opportunity as he struggles to protect the covert operation he inherited, and been running for years. Throw in a mysterious murderer professionally killing ageing Russians, linked to our heroes investigation which turns out to be a fifty year old cold war secret. This is the first book in the "Puppet Meisters Trilogy", and is such a quality read that i thoroughly enjoyed i have already bought the second book. Brilliant from first to last page, a very well plotted complete thriller in every sense of the word, John Le Carre's cerebral style meets Frederick Forsyth intense in depth description. Great credible characterisations, a real sense of time and place, constant plot twists, fast paced, absorbing, intriguing a complete page turner in ever sense of the words. I’ve been struggling to try to write this review and try to properly express my views on the book, because my opinion is rather conflicted. This was not a bad book. The writing is competent, and there was a fairly steady feeling of suspense through out. Our author did well with the history and the setting, to really give you that picture and keep both your interest and your intrigue. So, this story hit the marks of plot, setting, and intrigue. I never really felt like I got to know Scott that well, and I didn’t feel his motivations as strongly as I felt like I needed to in order to understand why he did the things he did. Ekaterina was too enigmatic for me to hook entirely into her, and in being so, Scott’s reactions to her just didn’t make as much sense to me. And sometimes characters that were supposed to be worldly felt rather…naive and foolish. There was one point where I just wanted to shout at each and every one of them about how no one even conceived of a particular fact. I don’t want to give it away here, but I came up with the theory almost instantly because I know that people can make things up. No one in the book even conceived of it, and their “but it’s all” explanations in not doing so felt thin. Otherwise, there were some things that felt like there weren’t properly explained, and did make some sections a bit confusing. If I’d been better connected to the characters, however, this probably wouldn’t have been as much of an issue. The story begins with Scott Mitchell and his friend Charlie aboard a plane that has just landed in Russia. Before anyone is allowed to depart, however, Scott finds himself in the hands of the FSB, in a small room, being held but not interrogated. There are two things I need to tell you about this book before you read it: If you don't care for political thrillers you won't like the book. However, if you find them not only interesting, but intriguing and thought-provoking, you will enjoy the book. 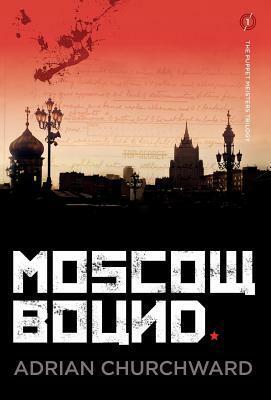 Moscow Bound reads like a movie script – full of suspense and action. Churchward has done an excellent job in researching this novel. I enjoyed the unfolding of the mystery. Although the mystery itself is very believable as it is based on actual events, I found the interaction between the various Russian agencies and oligarchs farfetched. Although I’m (unfortunately) certain that there is plenty of corruption in the modern Russian state, the animosity between the various organizations seemed unr Moscow Bound reads like a movie script – full of suspense and action. Churchward has done an excellent job in researching this novel. I enjoyed the unfolding of the mystery. Although the mystery itself is very believable as it is based on actual events, I found the interaction between the various Russian agencies and oligarchs farfetched. Although I’m (unfortunately) certain that there is plenty of corruption in the modern Russian state, the animosity between the various organizations seemed unrealistic. Perhaps the animosity was realistic but I didn’t buy the lengths the organizations went to in their fight for supremacy. In typical Russian novel fashion, the novel has an abundance of characters. Sometimes it can be a bit difficult to keep track of who’s who. Thankfully, Churchward has learned from his reading of Dostoyevsky to make Russian names that English language readers can understand and remember. Churchward’s background as an attorney shows through clearly in the character of Scott Mitchell. The dialogue of Mitchell as well as his interactions with his colleagues and friends is believable. Unfortunately, Mitchell’s interactions with the authorities are less than believable. For a human rights attorney, he seems to be all too comfortable in dealing with the authorities. I also found it a stretch that Romanova would ask an attorney (even if it is a human rights attorney) to find her father. Finding a missing person is an entirely different skill set than being an attorney. I recommend this novel to readers looking for a fast-paced story full of action and suspense. Ekaterina Romanova, wife of a Russian oligarch, asks Scot Mitchell for help. Scott, a Moscow based English human rights lawyer, has just come back from a great success and had a nasty encounter with Russian authorities who eye his doing with suspicion. Ekaterina wants to find her father whom she has never seen and whom she suspects to be hidden in one of the forbidden secret cities. At the same time, General Pravda is also on a tricky mission and when their ways cross and several murders are com Ekaterina Romanova, wife of a Russian oligarch, asks Scot Mitchell for help. Scott, a Moscow based English human rights lawyer, has just come back from a great success and had a nasty encounter with Russian authorities who eye his doing with suspicion. Ekaterina wants to find her father whom she has never seen and whom she suspects to be hidden in one of the forbidden secret cities. At the same time, General Pravda is also on a tricky mission and when their ways cross and several murders are committed, Scott’s life is threatened from different sides because he is about to reveal one of the best hidden secrets of the Cold War. A crime novel of the Cold War set many years after but nevertheless playing with classic oppositions. Churchward manages to portray a realistic situation which could happen every day in modern Russia and which is deep into international politics and the helplessness of the individual caught within the Russian system of espionage, threat and secret government ordered mission. It also shows that nobody, not even high-ranked generals, are safe from losing their position and their bosses’ favour and being shot. The plot itself is quick-paced and convincingly constructed, what I liked especially was the protagonist Scott who was drawn in an authentic way and acted not like a superhero but in a believable human way. As a fan of Jeffrey Deaver, I have to say that I'm not hopeful about novels promising twists and complex plots. Deaver is hard to beat. However, this is one of the few books I've read that I had to read in one sitting - I couldn't put it down. The political and geographical aspects of it make it stand out, and even whet your appetite for more knowledge of Soviet life. As a story it's a great page-turner, and as a novel it's a book that just leaves you wanting to learn more about what's going in th As a fan of Jeffrey Deaver, I have to say that I'm not hopeful about novels promising twists and complex plots. Deaver is hard to beat. However, this is one of the few books I've read that I had to read in one sitting - I couldn't put it down. As a story it's a great page-turner, and as a novel it's a book that just leaves you wanting to learn more about what's going in the world outside of the West. Surprisingly, (in my experience of such novels), the characters do actually draw you in, and don't feel flat and one-dimensional - I found myself rooting for Scott Mitchell, in a sometimes conflicted way, but with a quickening heartbeat. The story transcends its setting and brings to mind tales of abuse of power and personal conflict everywhere. When Mitchell is hired by a beautiful Russian woman to find her father, a man she’s never met and has very little information on, he is sk This was a complex story told from two different points of view: Scott Mitchell, a British human-rights lawyer who is returning to his home in Moscow after winning an epic case against the Russian Army in the European Court and Lieutenant-General Pravda of the GRU, military intelligence who’s tasked with protecting a secret that dates back to the Vietnam War. I read Moscow Bound over a period of 4 days and evenings. I didn't want to put it down. I especially liked the building of tension all the way through the story with one event setting the stage for the next. The descriptions--locations, how long it would take to get from one crisis to the next by car, and problems such as parking or cars that would not start because of the cold--grounded the reader. Relief from tension was provided by mention of similarities between the situation and things fami I read Moscow Bound over a period of 4 days and evenings. I didn't want to put it down. I especially liked the building of tension all the way through the story with one event setting the stage for the next. The descriptions--locations, how long it would take to get from one crisis to the next by car, and problems such as parking or cars that would not start because of the cold--grounded the reader. Relief from tension was provided by mention of similarities between the situation and things familiar to the reader--Columbo, Law & Order, and tennis quotes. Throughout the story, the reader experienced the changes that occurred in two men--Pravda, a Russian, and Mitchell, an Englishman--as each struggled to do what he thought was right. The ending left the reader wanting more. The story is quite interesting, although for the benefit of any future readers I should perhaps not give too much away. But the way the story is told is unsatisfactory. Not only did I fail to engage with any characters; none of them acquired enough flesh on the bones to become plausible, let alone interesting. For me they remained mere cardboard cutouts who went through the motions. It is perhaps of lesser importance that the author has only a sketchy understanding of Russian names; it is the wa The story is quite interesting, although for the benefit of any future readers I should perhaps not give too much away. But the way the story is told is unsatisfactory. Not only did I fail to engage with any characters; none of them acquired enough flesh on the bones to become plausible, let alone interesting. For me they remained mere cardboard cutouts who went through the motions. If you enjoy a fast moving and exciting read you will revel in this book. You will also learn the workings of some of the security agencies, which is very enlightening. The various plots and turns in this story are so gripping you just need to know what happens next and the suspense is such that you’ll find you just can’t put the book down. I’m really looking forward to the next part of this trlogy. Very enjoyable read. The plot makes you realise just how corrupt the world was and still is to some extent. The characters were believable especially Scott Mitchell. Very obvious the author had firsthand knowledge of Russia. It keeps you guessing and can't wait for the next instalment. I found myself shortening the Russian names as I got further into the book as couldn't wait to read further. My colleague wrote this book so I felt obliged to read. Despite not being my normal preference in genre Moscow Bound delivered on all fronts and could easily transfer to film. The dynamic between Ekaterina and Scott is full of twists and turns which compliments the story line perfectly. This novel will leave you wanting more and keeps you on the edge of your seat throughout. Cannot wait for the second instalment, a series I believe could go very very far. A fantastic read, especially if you have an interest in Russia (both Cold War and modern day). I loved the historical references scattered throughout the book. Only problem was that this was my bedtime reading which I use for winding-down and it was a bit too much of a fast-paced page-turner! Looking forward to the next part in the trilogy. "The Russian Government has a secret that dates back to the Vietnam War. When Ekaterina's mother dies, she doesn't expect the news that her father is still alive. Somehow the two are connected." This novel is set in modern day Russia with ties to the past. It has lots of characters, and is full of suspense and action. I would say it is a real page turner with a surprising twist. Some readers may have problems pronouncing all of the Russian names and places. I really enjoyed this book, particularly the description and detail of the Moscow location. It is a complex tale with enough twists to keep you guessing, and a compelling read. I hope the rest of the trilogy is as good. Moscow Bound is a fast paced and gripping spy thriller. Easy to get into but difficult to put down. Looking forward to the rest of the trilogy.